Welcome to Baltimore Party Bus! 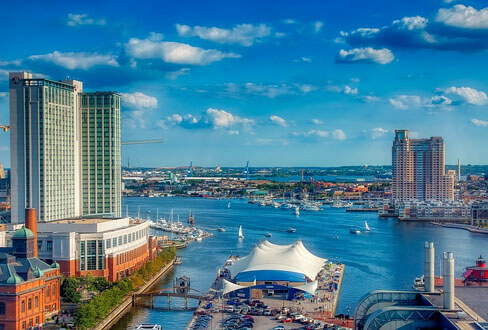 Baltimore is known around the U.S. for it's many activities surrounding the history of the United States, and it’s a city filled with culture. You’ll notice the many universities surrounding the area, which comes with great sporting events. The nightlife is without compare within the D.C and Baltimore area, so you’re sure to have an amazing time whenever you visit. And of course, when you do come to visit the lovely city of Baltimore, you may need a ride to one of these amazing events hosted withing Baltimore! And that's where Baltimore Party Bus comes in. Baltimore Party Bus has been serving the area with the best professional transportation. When it comes to limousines and party buses, you will not find anyone else who can serve you more fully. You can’t get any better than our company in regards to our quality of service, whether it’s your reservation phone call or the final drop off. Your questions will always be answered with ease by a knowledgeable expert, and your needs will always be satisfied! Be sure to check around our site to learn more about us and the quality service we provide to the great city of Baltimore and beyond! We are always happy to answer any questions you may have and are only a phone call or email away. If you’re ready to book, or you want to know more about vehicles and their availability, you can call or email us at any time. We’ll be glad to speak with you and help you find the exact vehicle for your needs! Need service in a city in the area? Be sure to check out DC Party Bus and New York Party Bus. If you're taking a far out of town trip we recommend Party Bus New Orleans. Hi! I just wanted to drop you a note to say thank you for the outstanding service that you have provided to me over the past year. My familiarity with you began when my best friend rented your services for a night of bar hopping a while back, and when I was planning my own night on the town, I thought I'd call her up and ask what the name of that company was! Your office staff was just awesome over the phone, taking the time to answer all of my questions since it was my first time renting a party bus. They gave me a free price quote without even asking for any personal information, and they offered me a discount for booking two trips at the same time, so I booked that night out as well as my birthday party! The savings was substantial. I chose a different vehicle for each of those trips and loved them both. We had such an amazing time, with the best part probably being the fact that I did not have to worry about figuring out the directions to each of our destinations, that I didn't have to fight traffic, and that parking was a total non-issue. Those are the things that just about ruin an outing for me and I was just so happy to not have anything to do with them! Being dropped off right at the door of each stop was just amazing. I felt a little bit like a celebrity pulling up to the red carpet each time! So glam and glitzy. I was so happy with those nights out that, as you well know, I returned for my bachelorette party and wedding! My hubby footed the bill for those two, bless him, and you guys gave him a substantial discount yet again for booking them both at the same time. You recommended the vehicles this time and we were very pleased with both of them. I had the wildest night on that party bus for my bachelorette party and we really celebrated to the fullest! More or less the same crew traveled with me on my wedding day and it was just beautiful. The buses looked so stunning in our wedding photography! I'm just so pleased and impressed. I've been recommending your services to everyone that I know and I hope those referrals bring you lots of business! I'm just so grateful for the good times that I've had with you over the past year, with these beautiful vehicles and your professional chauffeurs behind the wheel. Heading out into the city isn't a headache at all anymore, and when you split the cost with your friends, it's so affordable! Almost an afterthought. Thanks for bringing a little glitz and glamour to this special time in my life and for providing such caring, attentive service when I have questions or when I'm debating which bus to choose or what destinations to visit. You really are the very best!